JUSTICE: The practical result of loving God and loving others. The passage also goes on to illustrate through parable that our neighbor is much more than those who live next to us, but include all with whom we come in contact, even our enemies. Essentially, if we were to enter into real empathic relationships with others, to see them as equals, and to appreciate they matter as much to God as we do, we could do no other than to seek justice for everyone. Julie recognizes that learning to live justly in our everyday lives can be overwhelming, and so she begins her introduction with the sentence: “Don’t Panic.” For her, this is an incremental, life long change taken in baby steps. I can appreciate that. It let me approach the book with excitement to learn what I can be doing right away instead of with dread of being browbeaten with all I do wrong. 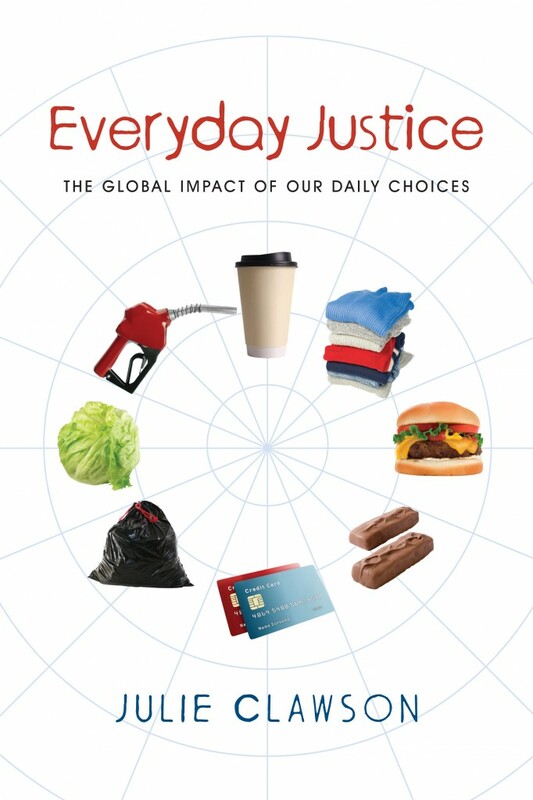 Through vignettes at the start of each chapter, it was easy to quickly identify with others who are struggling in specific areas of justice that impact our daily lives. Through background materials, I was provided with useful summaries of the injustices in areas such as food and coffee, clothing, cars/energy, waste, and international debt. Each chapter also provided useful suggestions for things anyone of us could do to begin addressing the injustices described. And while in some chapters I found my family and I had already made progress, in every chapter I found valuable new insights and ideas. Finally each chapter concluded with references to useful book, movie, and online resources for future investigation in a range of different topics. We have gotten stuck on this image of justice as retribution, as in the Department of Justice. But justice in the biblical sense has a deeper meaning that reflects a restoration of relationships, of being morally right, equitable, and fair. Seeing that justice is done helps people to rebuild — both victim and perpetrator. How often do we consider the importance of also bringing about reform in the form of remorse and repentance, and thereby restoration of the perpetrator of an injustice — say of the CEO’s of large businesses that contribute to an environmental disaster or to the continued functioning of a sweatshop? The world has enough resources to meet the needs of everyone when it is not tasked to meet the wants of just a few. Seeking justice is not just the realm of the few great women and men among us and in our history. Every one of us can and must do something today that can begin making a difference. The injustices initiated in large part by those in “developed” nations are a primary cause of economic and political instabilities. While not specifically stated in the book, this leads me to believe that a primary contributor to the extremely high level of US military spending ($663 billion in 2008; source Stockholm International Peace Research Institution Military Expenditure database) is our continued contributions to global injustice. Seeking justice is not just an individual act. It must also involve communities coming together. A great starting point would be for more people to read and discuss this book as an introduction to several key justice issues. (The book doesn’t directly cover other important justice issues surrounding racism, immigration, and prison/legal reform, for instance.) But only if we resolve to begin working together to address injustice through changes in our individual and communal behaviors will we see real restoration of relationships.